DNA is a molecule that contains the information needed to build an organism. This information is stored as a code made up of four chemicals: adenine (A), guanine (G), cytosine (C), and thymine (T). Every time a cell divides and copies its DNA, it accidentally introduces ‘typos’ into the code, known as mutations. Most mutations are harmless, but some can cause damage. All cells have ways to proofread DNA, and the more resources are devoted to proofreading, the less mutations occur. Simple organisms such as bacteria use less energy to reduce mutations, because their genomes may tolerate more damage. More complex organisms, from yeast to humans, instead need to proofread their genomes more thoroughly. Recent research has shown that humans have a lower mutation rate than chimpanzees and gorillas, their closest living relatives. Humans and other apes copy and proofread their DNA with basically the same biological machinery as yeast, which is about a billion years old. Yet, humans and apes have only existed for a small fraction of this time, a few million years. Why then do humans need to replicate and proofread their DNA differently from apes, and could it be that the way mutations arise is still evolving? Previous research revealed that European people experience more mutations within certain DNA motifs (specifically, the DNA sequences ‘TCC’, ‘TCT’, ‘CCC’ and ‘ACC’) than Africans or East Asians do. Now, Harris (who conducted the previous research) and Pritchard have compared how various human ethnic groups accumulate mutations and how these processes differ in different groups. Statistical analysis of the genomes of thousands of people from all over the world did indeed show that the mutation rates of many different three-letter DNA motifs have changed during the past 20,000 years of human evolution. Harris and Pritchard report that when groups of humans left Africa and settled in isolated populations across different continents, each population quickly became better at avoiding mutations in some genomic contexts, but worse in others. This suggests that the risk of passing on harmful mutations to future generations is changing and evolving at an even faster rate than was originally suspected. The results suggest that every human ethnic group carries specific variants of the genes which ensure that DNA replication and repair are accurate. These differences appear to influence which types of mutations are frequently passed down to future generations. An important next step will be to identify the genetic variants that could be controlling mutational patterns and how they affect human health. Germline mutations not only provide the raw material for evolution but also generate genetic load and inherited disease. Indeed, the vast majority of mutations that affect fitness are deleterious, and hence biological systems have evolved elaborate mechanisms for accurate DNA replication and repair of diverse types of spontaneous damage. Due to the combined action of hundreds of genes, mutation rates are extremely low–in humans, about one point mutation per 100 MB or about 60 genome-wide per generation (Kong et al., 2012; Ségurel et al., 2014). While the precise roles of most of the relevant genes have not been fully elucidated, research on somatic mutations in cancer has shown that defects in particular genes can lead to increased mutation rates within very specific sequence contexts (Alexandrov et al., 2013; Helleday et al., 2014). For example, mutations in the proofreading exonuclease domain of DNA polymerase ϵ cause TCT→TAT and TCG→TTG mutations on the leading DNA strand (Shinbrot et al., 2014). Mutational shifts of this kind have been referred to as ‘mutational signatures’. Specific signatures may also be caused by nongenetic factors such as chemical mutagens, UV damage, or guanine oxidation (Ohno et al., 2014). Together, these observations imply a high degree of specialization of individual genes involved in DNA proofreading and repair. While the repair system has evolved to be extremely accurate overall, theory suggests that in such a system, natural selection may have limited ability to fine-tune the efficacy of individual genes (Lynch, 2011; Sung et al., 2012). If a variant in a repair gene increases or decreases the overall mutation rate by a small amount–for example, only in a very specific sequence context–then the net effect on fitness may fall below the threshold at which natural selection is effective. (Drift tends to dominate selection when the change in fitness is less than the inverse of effective population size). The limits of selection on mutation rate modifiers are especially acute in recombining organisms such as humans because a variant that increases the mutation rate can recombine away from deleterious mutations it generates elsewhere in the genome. Given these theoretical predictions, we hypothesized that there may be substantial scope for modifiers of mutation rates to segregate within human populations, or between closely related species. Most triplet sequence contexts have mutation rates that vary across the evolutionary tree of mammals (Hwang and Green, 2004), but evolution of the mutation spectrum over short time scales has been less well described. Weak natural mutators have recently been observed in yeast (Bui et al., 2017) and inferred from human haplotype data (Seoighe and Scally, 2017); if such mutators affect specific pathways of proofreading or repair, then we may expect shifts in the abundance of mutations within particular sequence contexts. Indeed, one of us has recently identified a candidate signal of this type, namely an increase in TCC→TTC transitions in Europeans, relative to other populations (Harris, 2015); this was recently replicated (Mathieson and Reich, 2016). Here, we show that mutation spectrum change is much more widespread than these initial studies suggested: although the TCC→TTC rate increase in Europeans was unusually dramatic, smaller scale changes are so commonplace that almost every great ape species and human continental group has its own distinctive mutational spectrum. To investigate the mutational processes in different human populations, we classified each single nucleotide variants (SNV) in the 1000 Genomes Phase 3 data (Auton et al., 2015) in terms of its ancestral allele, derived allele, and 5’ and 3’ flanking nucleotides. We collapsed strand complements together to obtain 96 SNV categories. Since the detection of singletons may vary across samples, and because some singletons may result from cell-line or somatic mutations, we only considered variants seen in more than one copy. We further excluded variants in annotated repeats (since read mapping error rates may be higher in such regions) and in PhyloP conserved regions (to avoid selectively constrained regions) (Pollard et al., 2010). From the remaining sites, we calculated the distribution of derived SNVs carried by each Phase 3 individual. We used this as a proxy for the mutational input spectrum in the ancestors of each individual. To explore global patterns of the mutation spectrum, we performed principal component analysis (PCA) in which each individual was characterized simply by the fraction of their derived alleles in each of the 96 SNV categories (Figure 1A). PCA is commonly applied to individual-level genotypes, in which case the PCs are usually highly correlated with geography (Novembre et al., 2008). Although the triplet mutation spectrum is an extremely compressed summary statistic compared to typical genotype arrays, we found that it contains sufficient information to reliably classify individuals by continent of origin. The first principal component separated Africans from non-Africans, and the second separated Europeans from East Asians, with South Asians and admixed native Americans (Figure 1—figure supplement 2) appearing intermediate between the two. Global patterns of variation in SNV spectra. (A) Principal component analysis of individuals according to the fraction of derived alleles that each individual carries in each of 96 mutational types. (B) Heatmaps showing, for pairs of continental groups, the ratio of the proportions of SNVs in each of the 96 mutational types. Each block corresponds to one mutation type; within blocks, rows indicate the 5’ nucleotide, and columns indicate the 3’ nucleotide. Red colors indicate a greater fraction of a given mutation type in the first-listed group relative to the second. Points indicate significant contrasts at p <10−5. See Figure 1—figure supplements 1, 2 and 3 for heatmap comparisons between additional population pairs as well as a description of PCA loadings and the p-valuesof all mutation class enrichments. Figure 1—figure supplement 4 demonstrates that these patterns are unlikely to be driven by biased gene conversion. In Figure 1—figure supplement 5, we see that this mutation spectrum structure replicates on both strands of the transcribed genome as well as the non-transcribed portion of the genome. Figure 1—figure supplements 6, 7 and 8 show that most of this structure replicates across multiple chromatin states and varies little with replication timing. Remarkably, we found that the mutation spectrum differences among continental groups are composed of small shifts in the abundance of many different mutation types (Figure 1B). For example, comparing Africans and Europeans, 43 of the 96 mutation types are significant at a p<10−5 threshold using a forward variable selection procedure. 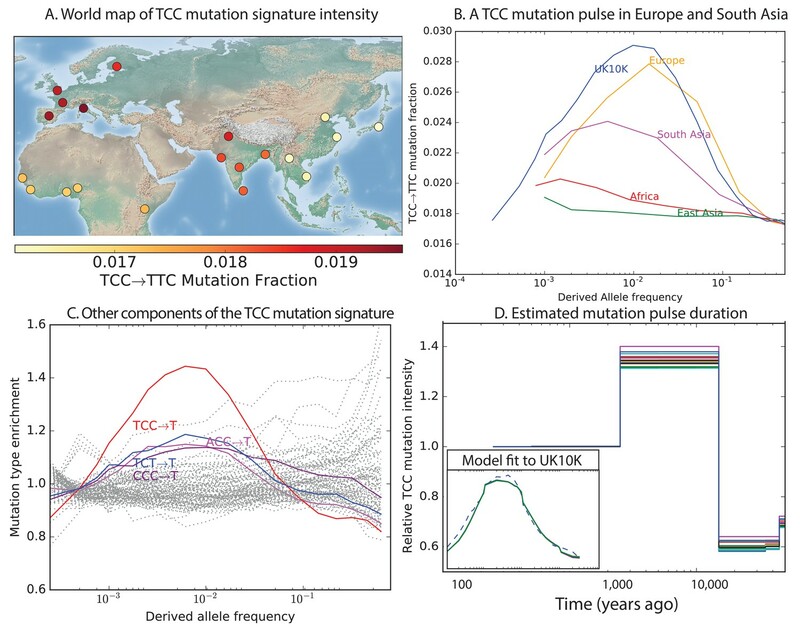 The previously described TCC→TTC signature partially drives the difference between Europeans and the other groups, but most other shifts are smaller in magnitude and appear to be spread over more diffuse sets of related mutation types. East Asians have excess A→T transversions in most sequence contexts, as well as about 10% more *AC→*CC mutations than any other group. Compared to Africans, all Eurasians have proportionally fewer C→* mutations relative to A→* mutations. One possible concern is that batch effects or other sequencing artifacts might contribute to differences in mutational spectra. Therefore we replicated our analysis using 201 genomes from the Simons Genome Diversity Project (Mallick et al., 2016). The SGDP genomes were sequenced at high coverage, independently from 1000 Genomes, using an almost non-overlapping panel of samples. We found extremely strong agreement between the mutational shifts in the two data sets (Figure 2). For example, all of the 43 mutation types with a significant difference between Africa and Europe (at p<10−5) in 1000 Genomes also show a frequency difference in the same direction in SGDP (comparing Africa and West Eurasia). In both 1000 Genomes and SGDP, the enrichment of *AC→*CC mutations in East Asia is larger in magnitude than any other signal aside from the previously described TCC→TTC imbalance. Concordance of mutational shifts in 1000 Genomes versus SGDP. 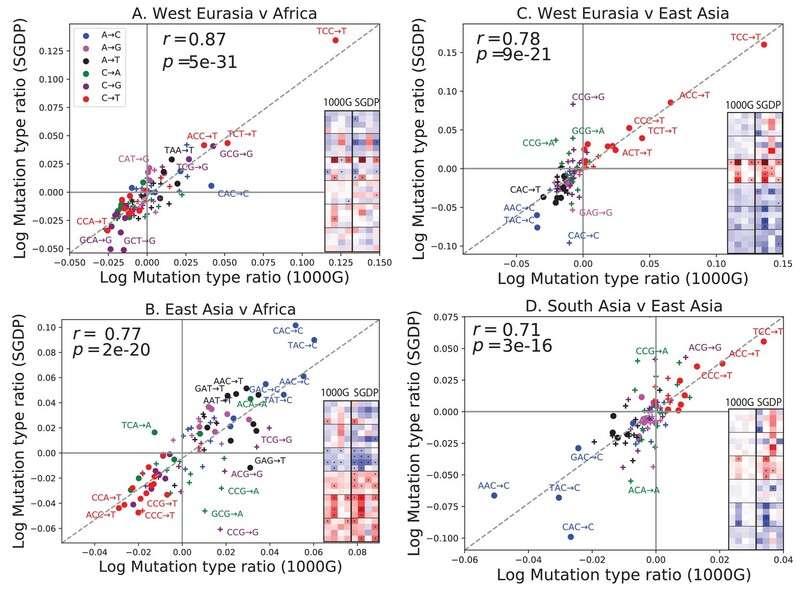 Each panel shows natural-log mutation spectrum ratios between a pair of continental groups, based on 1000 Genomes (x-axis) and SGDP (y-axis) data. Data points encoded by (+) symbols denote mutation types that are not significantly enriched in either population in the Figure 1 1000 Genomes analysis (p<10−5). These heatmaps use the same labeling and color scale as in Figure 1. All 1000 Genomes ratios in this figure were estimated after projecting the 1000 Genomes site frequency spectrum down to the sample size of SGDP. See Figure 2—figure supplements 1 and 2 for a complete set of SGDP heatmaps and regressions versus 1000 Genomes. The greatest discrepancies between 1000 Genomes and SGDP involve transversions at CpG sites, which are among the rarest mutational classes. These discrepancies might result from data processing differences or random sampling variation, but might also reflect differences in the fine-scale ethnic composition of the two panels. To investigate the timescale over which the mutation spectrum change occurred, we analyzed the allele frequency distribution of TCC→TTC mutations, which are highly enriched in Europeans (Figure 3A; p<1×10−300 for Europe vs. Africa) and to a lesser extent in South Asians. We calculated allele frequencies both in 1000 Genomes and in the larger UK10K genome panel (Walter et al., 2015). As expected for a signal that is primarily European, we found particular enrichment of these mutations at low frequencies. But surprisingly, the enrichment peaks around 0.6% frequency in UK10K, and there is practically no enrichment among the very lowest frequency variants (Figure 3B and Figure 3—figure supplement 1). C→T mutations on other backgrounds, namely within TCT, CCC and ACC contexts, are also enriched in Europe and South Asia and show a similar enrichment around 0.6% frequency that declines among rarer variants (Figure 3C). This suggests that these four mutation types comprise the signature of a single mutational pulse that is no longer active. No other mutation types show such a pulse-like distribution in UK10K, although several types show evidence of monotonic rate change over time (Figure 3—figure supplements 3, 4 and 5). Geographic distribution and age of the TCC mutation pulse. (A) Observed frequencies of TCC→TTC variants in 1000 Genomes populations. (B) Fraction of TCC→TTC variants as a function of allele frequency in different samples indicates that these peak around 1%. See Figure 3—figure supplement 1 for distributions of TCC→TTC allele frequency within all 1000 Genomes populations, and see Figure 3—figure supplement 2 for the replication of this result in the Exome Aggregation Consortium Data. In the UK10K data, which has the largest sample size, the peak occurs at 0.6% allele frequency. (C) Other enriched C→T mutations with similar context also peak at 0.6% frequency in UK10K. See Figure 3—figure supplements 3, 4 and 5 for labeled allele frequency distributions of all 96 mutation types (most represented here as unlabeled grey lines). 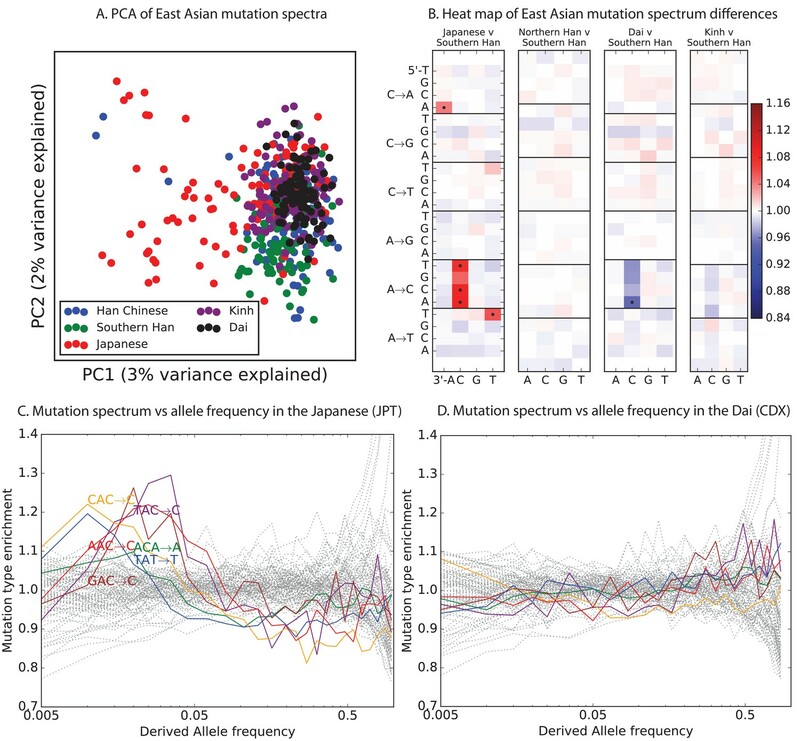 See Figure 3—figure supplement 6 for heatmap comparisons of the 1000 Genomes populations partitioned by allele frequency, which provide a different view of these patterns. (D) A population genetic model supports a pulse of TCC→TTC mutations from 15,000 to 2000 years ago. Inset shows the observed and predicted frequency distributions of this mutation under the inferred model. We used the enrichment of TCC→TTC mutations as a function of allele frequency to estimate when this mutation pulse was active. Assuming a simple piecewise-constant model, we infer that the rate of TCC→TTC mutations increased dramatically ∼15,000 years ago and decreased again ∼2000 years ago. This time-range is consistent with results showing this signal in a pair of prehistoric European samples from 7000 and 8000 years ago, respectively (Mathieson and Reich, 2016). We hypothesize that this mutation pulse may have been caused by a mutator allele that drifted up in frequency starting 15,000 years ago, but that is now rare or absent from present day populations. Although low frequency allele calls often contain a higher proportion of base calling errors than higher frequency allele calls do, it is not plausible that base-calling errors could be responsible for the pulse we have described. In the UK10K data, a minor allele present at 0.6% frequency corresponds to a derived allele that is present in 23 out of 3854 sampled haplotypes and supported by 80 short reads on average (assuming 7x coverage per individual). When independently generated datasets of different sizes are projected down to the same sample size, the TCC→TTC pulse spans the same range of allele frequencies in both datasets (Figure 3—figure supplements 1 and 2), which would not be the case if the shape of the curve were a function of low-frequency errors. Encouraged by these results, we sought to find other signatures of recent mutation pulses. We generated heatmaps and PCA plots of mutation spectrum variation within each continental group, looking for fine-scale differences between closely related populations (Figure 4 and Figure 4—figure supplement 1 through 6). In some cases, mutational spectra differ even between very closely related populations. For example, the *AC→*CC mutations with elevated rates in East Asia appear to be distributed heterogeneously within that group, with most of the load carried by a subset of the Japanese individuals. These individuals also have elevated rates of ACA→AAA and TAT→TTT mutations (Figure 4A and Figure 4—figure supplement 4). This signature appears to be present in only a handful of Chinese individuals, and no Kinh or Dai individuals. As seen for the European TCC mutation, the enrichment of these mutation types peaks at low frequencies, that is, ∼1%. Given the availability of only 200 Japanese individuals in 1000 Genomes, it is hard to say whether the true peak is at a frequency much lower than 1%. Mutational variation among east Asian populations. (A) PCA of east Asian samples from 1000 Genomes, based on the relative proportions of each of the 96 mutational types. See Figure 4—figure supplement 2 through 6 for other finescale population PCAs. (B) Heatmaps showing, for pairs of east Asian samples, the ratio of the proportions of SNVs in each of the 96 mutational types. Points indicate significant contrasts at p <10−5. See Figure 4—figure supplement 1 for additional finescale heatmaps. (C) and (D) Relative enrichment of each mutational type in Japanese and Dai, respectively as a function of allele frequency. Six mutation types that are enriched in JPT are indicated. Populations: CDX=Dai, CHB=Han (Beijing); CHS=Han (south China); KHV=Kinh; JPT=Japanese. PCA reveals relatively little fine-scale structure within the mutational spectra of Europeans or South Asians (Figure 4—figure supplements 5 and 6). However, Africans exhibit some substructure (Figure 4—figure supplement 3), with the Luhya exhibiting the most distinctive mutational spectrum. Unexpectedly, a closer examination of PC loadings reveals that the Luhya outliers are enriched for the same mutational signature identified in the Japanese. Even in Europeans and South Asians, the first PC is heavily weighted toward *AC→*CC, ACA→AAA, and TAT→TTT, although this signature explains less of the mutation spectrum variance within these more homogeneous populations. The sharing of this signature may suggest either parallel increases of a shared mutation modifier, or a shared aspect of environment or life history that affects the mutation spectrum. Finally, given our finding of extensive fine-scale variation in mutational spectra between human populations, we hypothesized that mutational variation between species is likely to be even greater. To compare the mutation spectra of the great apes in more detail, we obtained SNV data from the Great Ape Diversity Panel, which includes 78 whole genome sequences from six great ape species including human (Prado-Martinez et al., 2013). Overall, we find dramatic variation in mutational spectra among the great ape species (Figure 5 and Figure 5—figure supplement 1). Mutational differences among the great apes. (A) Relative abundance of SNV types in 5 ape species compared to Bornean Orangutan; data from (Prado-Martinez et al., 2013). Boxes indicate labels in (B). For additional comparisons see Figure 5—figure supplement 1. (B) Schematic phylogeny of the great apes highlighting notable changes in SNV abundance. As noted previously (Moorjani et al., 2016a), one major trend is a higher proportion of CpG mutations among the species closest to human, possibly reflecting lengthening generation time along the human lineage, consistent with previous indications that species closely related to humans have lower mutation rates than more distant species (Goodman, 1961; Li and Tanimura, 1987; Scally and Durbin, 2012). However, most other differences are not obviously related to known processes such as biased gene conversion and generation time change. The A→T mutation rate appears to have sped up in the common ancestor of humans, chimpanzees, and bonobos, a change that appears consistent with a mutator variant that was fixed instead of lost. It is unclear whether this ancient A→T speedup is related to the A→T speedup in East Asians. Other mutational signatures appear on only a single branch of the great ape tree, such as a slowdown of A→C mutations in gorillas. It is also known that shifts in generation time or other life-history traits may affect mutational spectra, particularly for CpG transitions (Martin and Palumbi, 1993; Amster and Sella, 2016). Most CpG transitions result from spontaneous methyl-cytosine deamination as opposed to errors in DNA replication. Hence the rate of CpG transitions is less affected by generation time than other mutations (Hwang and Green, 2004; Moorjani et al., 2016b; Gao et al., 2016). We observe that Europeans have a lower fraction of CpG variants compared to Africans, East Asians and South Asians (Figure 1B), consistent with a recent report of a lower rate of de novo CCG→CTG mutations in European individuals compared to Pakistanis (Narasimhan et al., 2016). Such a pattern may be consistent with a shorter average generation time in Europeans (Moorjani et al., 2016b), although it is unclear that a plausible shift in generation-time could produce such a large effect. Apart from this, the other patterns evident in Figure 1 do not seem explainable by known processes. In summary, we report here that, mutational spectra differ significantly among closely related human populations, and that they differ greatly among the great ape species. Our work shows that subtle, concerted shifts in the frequencies of many different mutation types are more widespread than dramatic jumps in the rate of single mutation types, although the existence of the European TCC→TTC pulse shows that both modes of evolution do occur (Harris, 2015; Moorjani et al., 2016b; Mathieson and Reich, 2016). At this time, we cannot exclude a role for nongenetic factors such as changes in life history or mutagen exposure in driving these signals. However, given the sheer diversity of the effects reported here, it seems parsimonious to us to propose that most of this variation is driven by the appearance and drift of genetic modifiers of mutation rate. This situation is perhaps reminiscent of the earlier observation that genome-wide recombination patterns are variable among individuals (Coop et al., 2008), and ultimate discovery of PRDM9 (Baudat et al., 2010); although in this case it is unlikely that a single gene is responsible for all signals seen here. As large datasets of de novo mutations become available, it should be possible to map mutator loci genome-wide. In summary, our results suggest the likelihood that mutational modifiers are an important part of the landscape of human genetic variation. Mutation spectra were computed using 1000 Genomes Phase 3 SNPs (Auton et al., 2015) that are biallelic, pass all 1000 Genomes quality filters, and are not adjacent to any N’s in the hg19 reference sequence. Ancestral states were assigned using the UCSC Genome Browser alignment of hg19 to the PanTro2 chimpanzee reference genome; SNPs were discarded if neither the reference nor alternate allele matched the chimpanzee reference. To minimize the potential impact of ancestral misidentification errors, SNPs with derived allele frequency higher than 0.98 were discarded. We also filtered out regions annotated as ‘conserved’ based on the 100-way PhyloP conservation score (Pollard et al., 2010), download from http://hgdownload.cse.ucsc.edu/goldenPath/hg19/phastCons100way/, as well as regions annotated as repeats by RepeatMasker (Smit et al., 2013), downloaded from http://hgdownload.cse.ucsc.edu/goldenpath/hg19/database/nestedRepeats.txt.gz. To be counted as part of the mutation spectrum of population P (which can be either a continental group or a finer-scale population from one city), a SNP should not be a singleton within population P–at least two copies of the ancestral and derived alleles must be present within that population. An identical approach was used to extract the mutation spectrum of the UK10K ALSPAC panel (Walter et al., 2015), which is not subdivided into smaller populations. The data were filtered as described in Field et al. (2016). The filtering procedure performed by Field et al. (2016) reduces the ALSPAC sample size to 1927 individuals. We also computed mutation spectra of the Simons Genome Diversity Panel (SGDP) populations (Mallick et al., 2016). Four of the SGDP populations, West Eurasia, East Asia, South Asia, and Africa, were compared to their direct counterparts in the 1000 Genomes data. Three additional SGDP populations, Central Asia and Siberia, Oceania, and America, had no close 1000 Genomes counterparts and were not analyzed here (although each project contained a panel of people from the Americans, the composition of the American panels was extremely different, with the 1000 Genomes populations being much more admixed with Europeans and Africans). SGDP sites with more than 20% missing data were not utilized. All other data processing was done the same way described for the 1000 Genomes data. Biallelic great ape SNPs were extracted from the Great Ape Diversity Panel VCF (Prado-Martinez et al., 2013), which is aligned to the hg18 human reference sequence. Ancestral states were assigned using the Great Ape Genetic Diversity project annotation, which used the Felsenstein pruning algorithm to assign allelic states to internal nodes in the great ape tree. In the Great Ape Diversity Panel, the most recent common ancestor (MRCA) of the human species is labeled as node 18; the MRCAs of chimpanzees, bonobos, gorillas, and orangutans, respectively, are labeled as node 16, node 17, node 19, and node 15. We extracted the state of each MRCA at each SNP in the alignment and used it to polarize the ancestral and derived allele at that site; a SNP was discarded whenever the ancestral node was assigned an uncertain or polymorphic ancestral state. As with the human data, SNPs with derived allele frequency higher than 0.98 were not used, and both repeats and PhyloP-annotated conserved regions were filtered away. The mutation type of an SNP is defined in terms of its ancestral allele, its derived allele, and its two immediate 5’ and 3’ neighbors. Two mutation types are considered equivalent if they are strand-complementary to each other (e.g. ACG→ATG is equivalent to CGT→CAT). This scheme classifies SNPs into 96 different mutation types, each that can be represented with an A or C ancestral allele. To compute the frequency fP⁢(m) of SNP m in population P, we count up all SNPs of type m where the derived allele is present in at least one representative of population P (which can be either a specific population such as YRI or a broader continental group such as AFR). After obtaining this count CP⁢(m), we define fP⁢(m) to be the ratio CP⁢(m)/∑m′CP⁢(m′), where the sum in the denominator ranges over all 96 mutation types m′. The enrichment of mutation type m in population P1 relative to population P2 is defined to be fP1⁢(m)/fP2⁢(m); these enrichments are visualized as heat maps in Figures 1B, 3B and 4A. To track changes in the mutational spectrum over time, we compute fP⁢(m) in bins of restricted allele frequency. This involves counting the number of SNPs of type m that are present at frequency ϕ in population P to obtain counts CP⁢(m,ϕ) and frequencies fP⁢(m,ϕ)=CP⁢(m,ϕ)/∑m′CP⁢(m′⁢ϕ). Deviation of the ratio fP⁢(m,ϕ)/fP⁢(m) from one indicates that the rate of m has fluctuated recently in the history of population P. To make the sampling noise approximately uniform across alleles of different frequencies, alleles of derived count greater than five were grouped into approximately log-spaced bins that each contained similar numbers of UK10K SNPs. More precisely, we defined a set of bin endpoints b1,b2,… such that the total number of SNPs ranging in derived allele count between bi and bi+1−1 is greater than or equal to the number of 5-ton SNPs, while the total number of SNPs ranging in derived allele count from bi to bi+1-2 is less than the number of 5-ton SNPs. This procedure is guaranteed to find fewer mutation types to differ significantly in rate between populations compared to separate chi-square tests. The python package matplotlib.mlab.PCA was used to perform PCA on the complete set of 1000 Genomes diploid genomes. First, the triplet mutational spectrum of each haplotype h was computed as a 96-element vector encoding the mutation frequencies (fh⁢(m))m of the non-singleton derived alleles present on that haplotype. The mutational spectrum of each diploid genome was then computed by averaging together the spectra of its two constituent haplotypes. 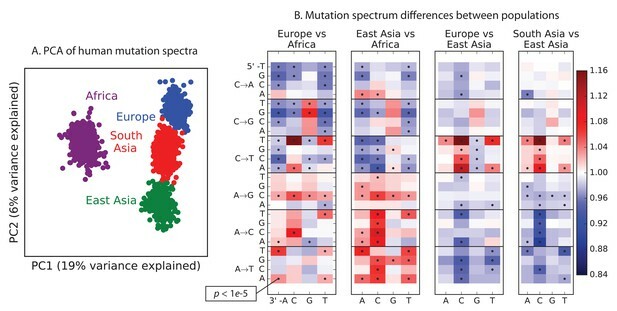 In the same way, a separate PCA was performed on each of the five continental groups to reveal finescale components of mutation spectrum variation. We estimated the duration and intensity of TCC→T rate acceleration in Europe by fitting a simple piecewise-constant rate model to the UK10K frequency data. To specify the parameters of the model, we divide time into discrete log-spaced intervals bounded by time points t1,…,td, assigning each interval a TCC→T mutation rate r0,…⁢rd. In units of generations before the present, the time discretization points were chosen to be: 20, 40, 200, 400, 800, 1200, 1600, 2000, 2400, 2800, 3200, 3600, 4000, 8000, 12,000, 16,000, 20,000, 24,000, 28,000, 32,000, 36,000, 40,000. We assume that the total rate r of mutations other than TCC→T stays constant over time (a first-order approximation). Although the underlying model of mutation rate change assumed here is very simple, it still represents an advance over the method used in (Harris, 2015) to estimate of the timing of the TCC→TTC mutation rate increase. That method relied upon explicit estimates of allele age from a dataset of less than 100 individuals, which are much noisier than integration of a joint distribution of allele age and frequency across a sample of thousands of haplotypes. Molecular Biology and Evolution 24:1792–1800. Annual Review of Genomics and Human Genetics 15:47–70. Thank you for submitting your article "Rapid evolution of the human mutation spectrum" for consideration by eLife. Your article has been favorably evaluated by Detlef Weigel (Senior Editor) and three reviewers, one of whom is a member of our Board of Reviewing Editors. The following individual involved in review of your submission has agreed to reveal his identity: Aylwyn Scally (Reviewer #2). There are often discrepancies in mutation rates and spectra inferred from short term observations and long term comparisons. One potential explanation is that these rates and spectra are not fixed, but vary in the course of evolution. This paper makes an important contribution, by documenting changes in the mutation spectrum during human evolution. It presents an analysis of population differences in the spectrum of context-dependent single nucleotide polymorphism, focused on humans and great apes. A previous observation about differences in mutation spectrum between human populations is replicated here and a hypothesis about a historical burst of mutation is presented. Many additional, weaker differences are also seen but replicated across data sets, which argues for biological, rather than experimental explanations. Very substantial differences among great apes are described. The original reviews are below. In terms of revision, the only major issue that we wish to see addressed concerns the analysis of the burst hypothesis. Specifically, there is a potential concern about whether certain artefacts could explain the apparent lack of evidence for the population-specific bias among the most recent mutations and questions about differences among populations in the relationship between allele frequency and age. There are also suggestions about how to look at patterns along the genome to hunt for clues as to possible causes. We have left the full reviews in as we think there are other ideas here that you may wish to pick up on, but pursuing them is not essential for the revision. We look forward to seeing the revision. This paper presents an analysis of population differences in the spectrum of context-dependent single nucleotide polymorphism, primarily focused on humans, but also analysing data from great apes. One of the authors previously reported a substantial difference in one particular type. This is replicated here and augmented with a large number of other, much weaker findings. These are replicated across data sets, which argues for biological, rather than experimental explanations. Very substantial differences among great apes are described. One specific hypothesis, about an apobec mutation is assessed and some – moderately weak – evidence for association is seen. The analyses presented are basically well done and reasonably compelling that there are repeatable differences in mutational spectra. The obvious – and I think rather important – criticism is that this works moves us no further along in terms of identifying causal factors. The authors argue for a contribution of transient mutator phenotypes. However, it is not clear how plausible this model is – most models of mutator suggest that they tend not to persist in sexually reproducing populations. This could potentially be explored by simulation. The authors argue that non-genetic factors – e.g. environmental exposure – are unlikely to explain the phenomena – though no hard evidence is given, although I agree that the great ape differences are compatible with a substantial genetic component. The only other substantial comment I have is around the analysis that fits the burst of TCC-to-TTC mutations. My concern is that sequencing data sets will have higher error rates at low frequencies and likely differential discovery based on sequence context due to systematic fluctuation in sequencing depth (true for both UK10k and 1000G). Hence, I have a concern that the most recent TCC->TTC mutations could be being lost/swamped in such a way that leads to an apparent burst, when the process is still active. This is a nice paper on a topic of current interest and relevance in human genetics and genomics. It points to important evidence for recent variability over time in at least some aspects of the human mutation rate, something which until now we have only been able to speculate about, and which has potentially broad implications for human evolutionary genetics. I have listed below a few thoughts and comments, including some things I think the authors should address. However, I found the paper well written and well presented, and have no major issues to raise. It would be good to get a sense of the raw numbers involved. What do the relative differences between populations mean in terms of actual numbers of variants? For example, what actual density of additional derived T alleles are there in Europe compared to Africa for the TCC->TTC signal? Is there an issue with ascertainment bias due to demography, in that the allele frequency spectrum varies between populations due to their differing demographic histories, and this might differentially affect the ascertainment of variants in different spectral classes, depending on their relative abundance? It would be interesting to know how the structure presented in Figure 1 varies with the age of the variants used to construct it (or, as a proxy, their allele frequency). Presumably one would expect the differences between populations to disappear as one excludes more recent variants, as older ones are more likely to be shared. Is this the case? I think the procedure used to estimate statistical significance, referred to as 'a forward variable selection procedure' needs a better description and motivation. It's not wholly clear to me how the procedure adopted achieves its goal of minimising the interdependence of the tests for each mutation type. It looks to me like some form of partitioned chi-squared test for comparing multiple proportions, but I don't know this statistical literature well – can you cite a useful reference or else explain how you arrived at it? I'd be happy with just testing for a significant overall difference in spectrum between two populations – is testing for significance of individual components of the spectrum really necessary? For the differences within the great ape tree, did you also compare with an outgroup such as macaque or gibbon? It wasn't clear how you polarise the C-T rate difference as an increase on the Pongine branch, and the CpG rate difference as an increase in Hominines. This article extends previous knowledge on heterogeneity of mutational spectra between populations. It detailed differences in frequencies of specific mutation types between diverse population groups. Moreover, authors date TCC->TTC mutational pulse for the European population. The arguments supporting the main conclusion of the study seem convincing, although the discussion of possible importance of evolutionary forces other than mutation would be helpful (e.g. interaction between BGC and demographic history). There is a noticeable overlap with the earlier work, and the manuscript would strongly benefit from additional analyses of the observed mutational patterns. For example, are the relative increases of mutation types uniformly distributed along the genome or enriched in specific genomic locations? Are they associated with epigenomic features or display asymmetry with respect to transcription or replication? Are they dependent on local recombination rate? Any analysis suggesting of a mechanistic hypothesis underlying the observation would strengthen the paper. In contrast to the main result of the manuscript, I am skeptical about the conjecture related to the APOBEC-induced mutagenesis. It is not statistically sound and based on arbitrary thresholds. Is it possible to compare replication asymmetry of APOBEC-like mutations (TC[A/T]-> [C/G]) between populations with different frequencies of variants associated with breast or bladder cancer? Figure 3B and Figure 3—figure supplement 2 illustrate how well supported the pulse pattern is in all cases. The point about differences between populations in the relationship between allele frequency and age is addressed in direct response to reviewer 2. We appreciate this encouraging response, and have incorporated many ideas from these reviews into additional supplementary analyses. As described in more detail below, we have added new supplementary heat map figures that describe the variation of the human mutation spectrum with allele frequency, replication timing, chromatin state, and transcription. We have also attempted to clarify the description of our significance-testing procedure in the Methods section. Finally, we decided to remove the APOBEC analysis given that it is less conclusive than the other sections of the paper and appears to have detracted, in the eyes of the reviewers, from the impact of the paper’s main conclusions. It is a fair point that we have not yet nailed down concrete mechanisms that are causing mutation spectrum evolution. However, it is our hope that describing the temporal structure of mutation spectrum change will bring us and others closer achieving this goal in the future. Thanks to the work done in this paper, we now know that the TCC→TTC pulse appears to be presently inactive, meaning that it is probably not caused by currently segregating genetic variation that could be mapped via genome-wide association approaches. This implies that the TCC→TTC pulse might not be the best signal to chase in search of causal factors, which is an important thing to keep in mind for anyone who wants to tackle the challenging problem of mapping mutators in the future. This paper also shows that there are other mutation spectrum differences between populations that are weaker in magnitude than the TCC→TTC pulse, but are nevertheless reproducible and might be better leads to go after in search of the molecular underpinnings of mutation rate variation. In terms of the plausibility of mutator phenotypes existing in sexual populations, a natural mutator phenotype was recently identified in yeast (see “Mis- match repair incompatibilities in diverse yeast populations” by Bui, et al. Genetics 2017). We believe that the new analyses presented in Figure 3—figure supplements 2 and 6 provide good evidence that sequencing errors are not artificially deflating estimates of the TCC→TTC mutation fraction at low frequencies. The raw numbers of TCC→TTC mutations (as well as mutations in other contexts) are available in the supplementary file total_continent_mut_counts.txt. In particular, there are 270,538 TCC→TTC variants in Africa compared to 187,174 in Europe (where there are many fewer total SNPs). With regard to the relationship between allele age and allele frequency, it is a fair point that different populations have different relationships between allele frequency and allele age due to contrasting demographic histories. However, differences in the relationship between allele frequency and allele age cannot produce differences between the mutation spectra of two populations in the scenario where each population has experienced an identical rate and spectrum of mutations throughout recent history. The exception to this would be if selective forces like biased gene conversion caused different populations to retain certain classes of mutations at different rates, which is plausible in principle since selective forces act more weakly in populations of smaller effective size. The observed patterns are not consistent with classical biased gene conversion though – if biased gene conversion were the only force creating differences between population mutation spectra, all C/G⇌A/T mutations would be affected in much the same way regardless of sequence context and neither C⇌G nor A⇌T mutations should have differences in abundance between populations. This is a nice suggestion for bridging the visualizations presented in Figure 1 and Figure 2. We now include this analysis as Figure 3—figure supplement 6, and it indeed shows that differences disappear as we restrict to higher frequency variants. Since this procedure is not described in the literature to our knowledge, we have expanded its description in the supporting information to include better motivation for what is done (see Methods section). These p-values are used to annotate Figure 1A with the dots that denote significance. We think that conservatively estimating the number of mutation types that vary in rate between populations is important to this paper because Harris 2015 focused on the rate distribution of a single mutation type and we want to emphasize here that mutation spectrum evolution is much more pervasive than that. We have rephrased the statement about CpGs to say, “one major trend is a higher proportion of CpG mutations among the species closest to human” to be more agnostic about the question of whether the rate decreased in one part of the tree versus increased in another part of the tree. For statements about A→T and A→C mutations in the great apes, we have left in language that hypothesizes increases and decreases in rate because these are supported by parsimony (i.e., the rate differential is more parsimoniously explained by a rate increase along one branch of the tree than by rate decreases along two separate branches). We agree and, we have included new supplementary figures showing how these patterns vary with replication timing, chromatin state, and transcriptional state. Our main inference from these figures is that the discernible features of Figure 1B appear to vary only modestly across the genome. We agree that these conclusions about APOBEC-induced mutagenesis are not as decisive as the main conclusions in the paper. We intended this analysis to work as a useful illustration of how linkage disequilibrium can be used to test hypotheses about mutator activity, but in revising the paper, we have decided to remove this section to avoid detracting from the impact of the more key points we are making. This work was funded by NIH grants GM116381 and HG008140, and by the Howard Hughes Medical Institute. We thank Jeffrey Spence and Yun S Song for technical assistance. We also thank Ziyue Gao, Arbel Harpak, Molly Przeworski, Joshua Schraiber, and Aylwyn Scally for comments and discussion, as well as two anonymous reviewers. © 2017, Harris et al.